He invented dozens of amazing musical instruments. Some were fantastical. Others were hugely successful, and led to modern instruments like the Flugelhorn and Euphonium. 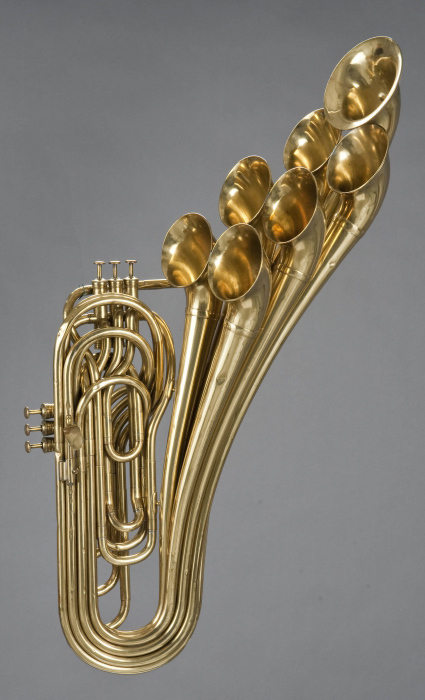 He designed significant improvements to virtually every existing wind instrument—improvements that last to today. 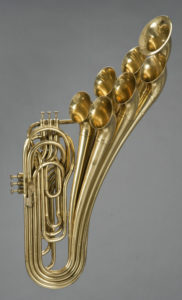 Trombone with six valves and seven bells. 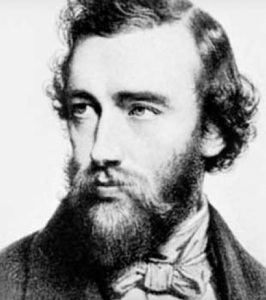 Adolphe Sax, Paris, 1876. The fist saxophone he built was not the alto or tenor or even baritone but the now-rare BASS saxophone, which is twice the length of the tenor and four times the length of the soprano. Sax moved at age 30 from Belgium to Paris, the center of the European musical instrument industry. Despite the superiority of his instruments, he was given no hero’s welcome. Rather, the existing establishment tried every way they could to eliminate him… through constant vandalism, frivolous law suits, and even multiple attempts on his life. First they maligned his designs, then they stole them for their own profit. Sadly, they drove him into bankruptcy. Let’s give it up for the poor, brilliant soul to whom we owe so much!! This content © 2014 Anton Schwartz. Sax certainly had his talents, but he won his biggest success by getting a French court to give him patent protection on brass valves that were invented long before he started using them. It was a notorious case, and drove one of the best French brass instrument builders out of the country. And the Saxhorns he ‘designed’ and sold were copies of instrument he saw when traveling in Italy. His Saxophones were a great idea, but as a businessman he was more a schemer than a legitimate entrepreneur. I’m sorry to hear that, Mark. It’s not something I’ve previously heard. Do you have a reference or two for us?